How important is visitor insight to museums and what are some of the main benefits that it can provide, such as resilience and better visitor experiences? Visitor insight is crucial for museums to not only understand who their visitors are and curating engaging, relevant exhibitions, but where there are opportunities to innovate and develop the way they experience the museum. Visitors need the confidence to explore and discover, and visitor insights mean we can understand where this is missing, and design and develop ways for them to build this confidence. While we can learn from past projects, every venue is different; the content, scale, layout and customer base will vary and therefore so do the insights. We need to understand these direct insights to draw out new opportunities that are endorsed by ‘users’ – visitors and staff. Co-creativity with these user groups is a must for creating better experiences across a range of service delivery channels. Many cultural spaces are realising the power of collaborative work streams to help understand the types of content a visitor wants, when they want it and how they wish to digest a range of information. Parallel to this, co-creating with front of house and back of house staff brings valuable perspectives, which mustn’t be undervalued. By co-creating output with visitors, the museum remains front of mind, relevant and memorable. By co-creating with staff, they are very much part of the change process and can be the best advocates for a new exhibition, gallery or project. The client gets a significantly better project internally and externally. In what ways have you aided and reflected this in your work and in what ways will you continue to do so? We design driven by human behaviour. Our work across multiple sectors, including culture and heritage, allows us to have a unique view of a range of end users, from visitors and passengers to patients and customers. We have a series entitled Parallel that brings together different sectors to help break down siloed thinking, innovate an experience or solve a problem. We are using immersive technology to help validate concepts with users before they are put in place rather than afterwards, which can be very costly. Where time allows, temporary wayfinding schemes mean you can use the actual location to test ideas, concepts and behavioural change. 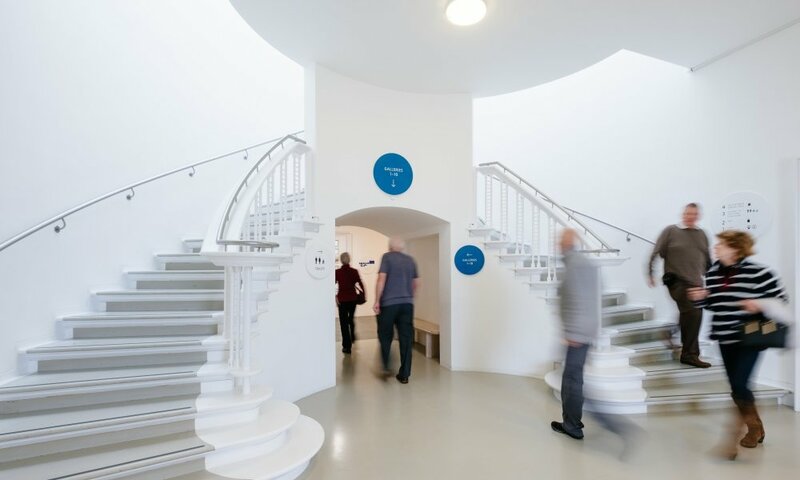 At Tate St Ives, we were able to install a temporary wayfinding scheme six months prior to the permanent installation which allowed validation of the design. 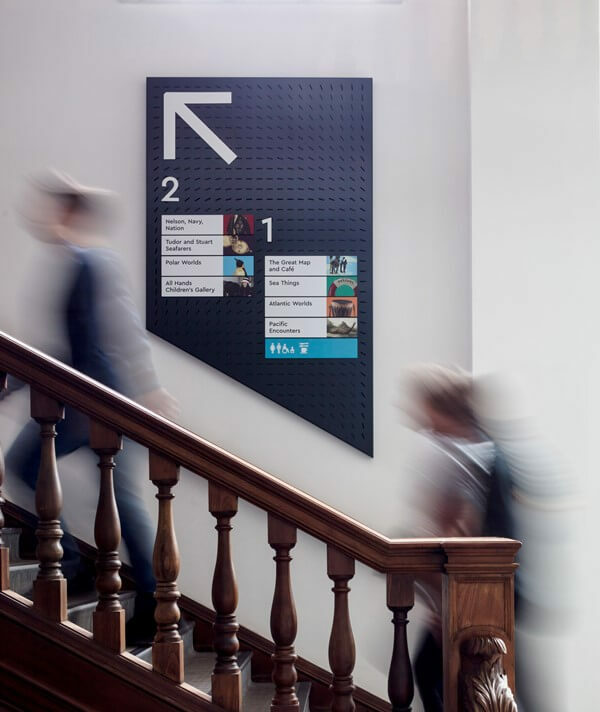 The success of the wayfinding system in testing was thanks to the emphasis we had placed on detailed visitor insights. What are some of the challenges museums face when trying to gain better visitor insight? It’s unfortunate, but funding is forever an issue, year-on-year budgets are getting smaller, so the challenge is only increasing. For museums to better understand the motivations, drivers, wants and needs of their visitors means an investment in time and expertise to gain these highly beneficial insights. A truly user-centric design solution is much more powerful and results in measurable change, as we’ve seen at the National Maritime Museum. A further challenge is developing experiences that are for everyone. This can only be achieved with the right level of engagement and consultation with all user types. We prioritise designing for all, wherever possible, to create truly inclusive experiences. CCDs Associate Accessibility Consultant supports us with these insights, allowing us to be better informed and widen our expertise. How do you help overcome these challenges? We need to help our clients find pragmatic solutions to assist in any budgetary constraints, but also help them in the future. This means a business case that shows potential return, an approach we’ve learned from our aviation projects that are often commercially driven. Revenue opportunities could result from increasing dwell time, which could, in turn, up sales in the café and gift shop; better promotion of both can also contribute to these improvements. Other opportunities that we explore include more persuasive platforms for donation (touch and interactive) and sponsorship deals for products and screens, which can result in significant savings. Collectively these opportunities can help organisations improve their revenues, which allow them to invest in projects, the starting point being better understanding the visitor mind-set. Can you give a brief example of a recent project you worked on where a museum or heritage organisation has benefitted from your expertise and what this has involved? 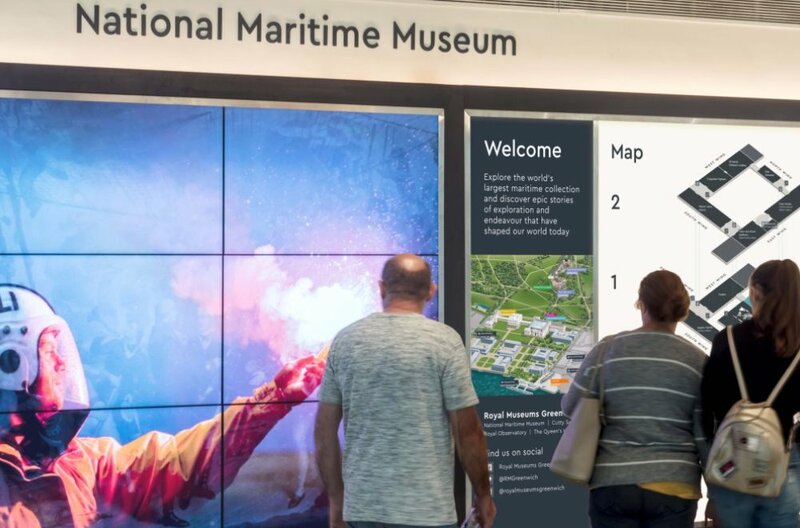 At National Maritime Museum in Greenwich, London, visitor insights were crucial to the design and development of the wayfinding. They showed us how limited exploration was beyond the ground floor – the layout was confusing to visitors so there was a lack of vertical circulation. 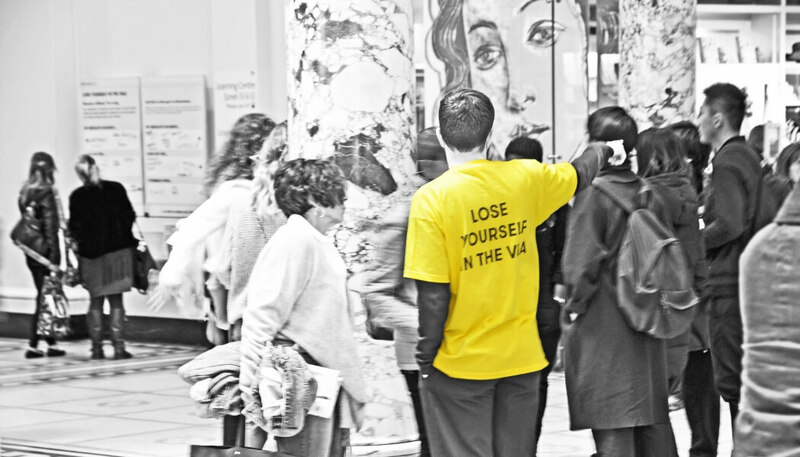 Our user research also exposed that visitors had a relatively poor understanding of the exhibitions available, somewhat due to the hierarchy of information and the way it was displayed – in a long list of options shown on directories. This is a common approach adopted by many institutions but isn’t captivating for visitors to read. We’ve taken these insights and designed targeted interventions including large environmental wayfinding and key vertical circulation zones to encourage movement to the upper galleries. We’ve also reduced the number of exhibitions on signs and instead created a highlight trail specifically designed to move visitors through a curated journey of discovery. Lastly, we’ve made everything more visual. Our insights suggested visitors are more likely to make informed decisions with the aid of imagery, so we accompanied each direction with a hero image to better provoke decision making and also helps non-English speaking visitors explore and discover the museum. Visitors also needed more information on what could be found inside the museum. Digital ‘Welcome Hubs’ (pictured), co-designed with NMM’s inhouse team, act as an access point to find out more about the museum offer: maps and navigation, the other Royal Museums Greenwich sites, and a list of ‘What’s on’. Post-installation feedback from front of house staff suggests this approach has been a great success, and the project has been shortlisted for two awards. Where do you see major developments/innovations in how we can better understand visitor behaviour evolving over the next five years? We are already seeing trend of immersive experiences in many sectors, including culture, heritage and retail. Visitors want a more personalised, connected and curated experience. Google’s Curiosity Rooms in London earlier this year was a prime example – we’ll only see these types of experiences grow. Within five years, curators might well be the person standing next to you in the gallery, or the local history group gamifying their content for you to find and explore. With potentially more time to explore spaces and gather new experiences, these faster ways of accessing information will make cultural arenas more flexible and fluid. Advances in technology bring more capability to gain ‘live’ or more time-sensitive feedback from visitor behaviours. Social media will continue to play a key role in understanding visitor reaction and interaction with the museum (from an online perspective); this will only become more prevalent. In the future it’s quite likely we’ll see better integration and cooperation between social media platforms and the museum, which in-turn could provide insightful data, stats and feedback directly to the organisation; this may even supersede the need for institutions to have their own website and mobile application. We’ve seen that visitors better engage with their chosen social media platform than any other website, so why not integrate the two and have a more supportive network of information that befits all concerned. This would of course be a big leap, but with better access to user data, museums have the potential to be personal and engaging with its end users.